The past is never really set in stone, except as the gravestones and monuments that remain with us from other eras. And even they can be toppled or fall into ruin. It applies to music as well as anything. Music history is in reality a fluid, plastic thing, subject to revisions and additions (and deletions) like any other form of knowledge over time. 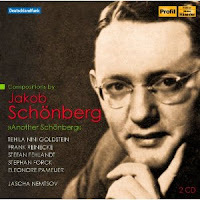 Enter one Jakob Schoenberg (1900-1956), a composer with the same last name, of course, as the famous one. And then enter a two-CD set of his music, Another Schoenberg (Edition Hassler Profil PH 12023). Before hearing this new set I knew nothing of the composer, and I rightly suppose there are many others who didn't/don't as well. There are reasons we don't and this is not the place to go into that. But it is not for reason of the quality of his music, as this set makes quite clear. The set covers some wonderful lieder and chamber music, impressively performed. If this set is representative, as I assume it is, much of his musical output reflects and pays tribute to his Jewish heritage, either directly or as a melodic-scalular backbone. So we have a number of excellent song cycles in the set that rework traditional Hebraic song material. Soprano Tehila Nini Goldstein does full justice to the music, as do the chamber players involved as called upon. In addition to the songs there is a "Hasidic Suite for Piano," a Sonata for Violin and Piano and a Piano Quartet. Throughout we hear music that is extraordinary in the various ways it combines an early modernism with Jewish tonality. This is no "also-ran" composer, but rather one to listen to closely and savor. Jakob Schoenberg, in short, fully deserves our listening attention, at least in terms of the works included in this disk set. I hope we can hear in subsequent volumes, assuming there are scores available, his music for larger forces. In the meantime this one is a find! Hear it and you'll hear something very good indeed. I said something like this yesterday but it bears repeating and expanding. There are artists of such importance that it takes years to grasp fully what they are about. John Cage is one of them. If you listen to and begin to understand his music over time, you hear differently. And not just music. You hear the world in a more meaningful way. I can remember my first encounter with his music. The early electronic mixes I grasped immediately, in part because it was a era where these sorts of collaged sounds had become already a part of musical counter-culture. But the instrumental music. I'd get to the long silences and automatically get up off my chair to flip the record. It exasperated me. Was the music over or what? And the sounds themselves. Were they just a random hodgepodge? No and even if they were (they weren't) you started to hear that differently. Performers too over the years have become much more fully cognizant, I think, of the meaning of it all, the sensuality of it, the cosmic quality if you will. So here we are celebrating Cage's Centennial. He'd be 100 this year had he lived. There is a release that celebrates it quietly and profoundly, in ways John would have liked. I refer to Giancarlo Simonacci's Piano Music Volume 4 (Brilliant Classics 9263), a three-CD set. There are works of importance to be had here, played with intelligence and sensitivity. The "Music for Piano", all 84 pieces from 1952-53, are included, as are some prime later works: ASLSP from 1985, and several versions of ONE (1987-90). These are works of high abstraction, endlessly listenable because extraordinarily counterintuitive. There is no satiation point with this music because there is no point where you fully internalize it. That also means that a first hearing for the uninitiated may be confusing, incomprehensible. That's a given and it takes time to understand Cage, perhaps a lifetime. It doesn't take that long to enter John's musical world however. If you don't force your expectations on this music and let it go its way, it is very contemplative, rather rapidly so. These are works that demand an extraordinary sensibility on the part of the performer. There's no one way to do the music. But then there are versions that may not come across well nevertheless. Giancarlo Simonacci does not give us such versions here. He does the opposite. These are versions as spirited and simultaneously as detached (in a Zen sort of way) as I've heard. They are beautiful, if Cage would accept that as a valid categorization. Beautiful Cage. Music to live with a lifetime. Music that changed music. Essential, in other words. The John Cage (1912-1992) Centennial reminds us of the incredibly productive output and conceptually game-changing outlook of the American composer while he lived. There were so many different aspects of his music and what it meant, each important and influential, and in many ways we are still catching up to how far he went. This is no less true of performance realizations as it is of listener appreciation and consciousness-raising. 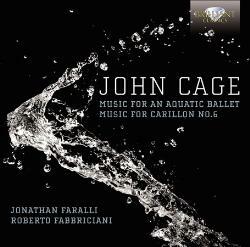 Both aspects are affected on the eight-work disk recently released by Roberto Fabbriciani (flutes) and Jonathan Faralli (percussion), Music for an Aquatic Ballet, Music for Carillon No. 6 (Brilliant 9284). It's a whirlwind journey through some of Cage's unrecorded and rarely recorded works. It also features works realized in unique versions by the duo. "Music for an Aquatic Ballet" was performed in 1938 at the National Aquatic Show in LA. The score has been lost but descriptions survive of a piece centered around tam tams and gongs played in the water in part to allow the synchronized swimmers to follow the music even when submerged. Fabbriciani and Faralli realize very freely a version for flute, percussion and tape which is in effect a re-composition in tribute to the lost work and in its spirit. What follows are quirky, creative and quite listenable versions of works that span much of his career. 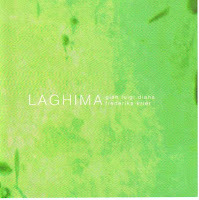 There are concrete, natural and human sounds on tape as called for, and the flute and percussion work is exemplary. The album ends with a first recording of Cage's "Music for Carillon No. 6" in a version for flute and percussion. It was never performed in Cage's lifetime and this is a first recording. What is most important, ultimately, is that Fabbriciani and Faralli have created a memorable program of Cagean music that is fascinating and very musical. 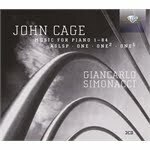 It's a fine disk and will most certainly appeal to the adventurous listeners out there, not only confirmed Cage fans. The pulsation, the beat if you will, of some of the early minimalists was one of the things that attracted me to their music. Riley and Reich did landmark works in a gradualist realm, but they also "rocked out" in their own way. Some composers got away from the pulse in years following, for better or lesser results, but I still find In C and Reich's instrumental/vocal pieces of his early-mid post-electronic period to be works I continue to turn to with pleasure. And they all pulsate like the Dickens. The EP Stainless Staining (Cantaloupe) brings back the pulsation in ways that appeal to me. 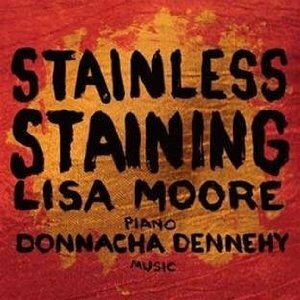 Lisa Moore is the pianist here, playing the music of Donnacha Dennehy. There are two pieces on the 24 minute disk. "RESERVOIR for Piano" forms a rather attractive postlude to the main event, which is the title track. "Stainless Staining" uses a "soundtrack" of samples of low G# retuned to accentuate 100 overtones derived from that fundamental. The samples involve playing inside and outside the piano. 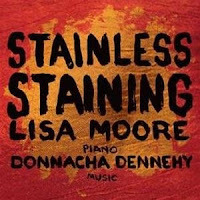 The result is a pulsating mass of piano sound, atop which Lisa Moore plays her "live" part. In the end it is 15 minutes of very rhythmic, patterned, richly overtoned music. Lisa Moore plays her role perfectly and the music buzzes and swings its way through your head with irresistible drive and elan. It's a disk that will be finding its way onto my player many times in the future I am sure. In its own way it has a perfection. It is a kind of heaven! Would you require more than that? The only constant about the music of Charles Koechlin (1867-1950) is Charles Koechlin himself. Charles Koechlin, the original. He is not a romantic. He is not a modernist. He does not really sound like Debussy or Ravel, not precisely. Perhaps one can only say that he is a composer that has his own version of being French, like Satie. He does not sound Teutonic at any rate. So when listening to the four-work Oeuvres pour Ensembles (Timpani 1C1193), one must prepare to hear Koechlin. Koechlin the chamber work composer of excellence. Koechlin the lyricist. The weaver of colored tapestries. Ensemble Initium and Ensemble Contraste share the performance assignments, and both ensembles sparkle with brilliance in realizing the works at hand. The compositions span most of Koechlin's career, dating from 1916 to 1949. The instrumentation varies with each work; the size of the ensembles keeps to 6-8 players throughout. Winds and strings are the primary carriers of his music on these works. One work adds a piano. I have to my knowledge not had the pleasure of hearing any of the works previously. I will be certainly hearing them many times more via this marvelous disk. This would make a great introduction to the composer for those who are not familiar. It is most certainly a welcome addition to any Koechlin enthusiast's library, or anyone wishing to explore some excellent examples of 20th century French chamber music. Living, breathing, right-here-and-now composer Giorgio Mirto writes music of a certain passion. 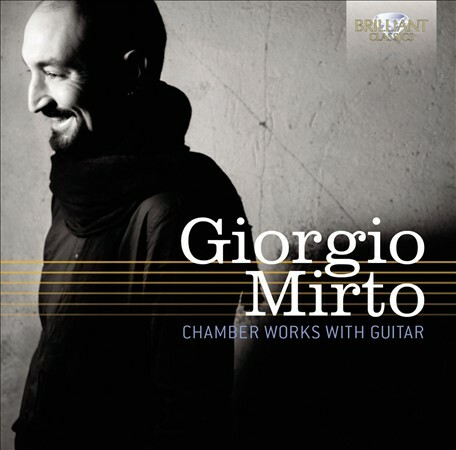 His album Chamber Works with Guitar (Briliant Classics 9259) makes that clear from the first listen. There is a (seemingly) Gypsy-inspired rhapsody for violin and guitar that soars, some wonderful miniatures for three guitars, and Triest, Solitario y Final for guitar and string quartet, which I find especially attractive. Much of the music on this disc could have been written 100 years ago or more and would have seemed in keeping with the times. The classical guitar tradition anchors the music in a place that respects the idiomatic aspects of writing for the instrument. Mirto excels in devising fresh and lively music that works its way from the tradition towards the light of the present day. Giorgio Mirto has a lyric strain, a neo-Spanish feel for dance form allusions and well thought-out multi-guitar writing. But the pieces that combine guitars and bowed strings show a sure mastery of both families of instruments, as well as a definite flair for music that is dramatic and memorable. Maestro Mirto writes music that delights. For those who revel in the classical guitar especially, he is a great pleasure to hear. I haven't gotten to the point in my listening where somebody can play me an unidentified disk and I can snap my fingers and say, "that's Per Norgard!" The later modernist doesn't sound like anybody else, yet there is much to his style, a highly developed sense of melodic abstraction juxtaposed with his own rather unique vernacular and sense of the subtly offbeat that takes time to appreciate fully. I am still in the process of getting there myself. His new disk Sceneries for Percussion and Ensemble (DaCapo 8.226092) gives the listener four substantial works in the chamber mode. The first two, "Prelude to Breaking" for eight instruments (1986) and "Four Meditations" for seven instruments (2010) get a full and detailed sound in a mini-chamber orchestra zone. These are very charactered works, tonal and extra-tonal, narrative in flow and yet filled with abstractions at times, different enough that after five listens I find an appreciation growing in me and the need to hear them more. "Arabesques" for solo percussion (2011) is in part based on a motif from the concluding work. It was written for percussion virtuoso Christian Martinez, who tackles a large array of pitched and unpitched instruments in an impressive manner. It has texture and ornament, moments of great rhythmic drama, and also more quiescent interludes. The composer states in the liners that one should try not to hear the music in terms of pulsation. "The rhythms are scewed" with fast and slow versions of the central motif sometimes played simultaneously, and with "small meander like windings and melodic fluctuations." So be it. A part for musical saw emerges. It works around some melodic material and adds a texture-color. The saw part did not entirely stimulate me but it most certainly has an otherworldly quality. Christian, his saw, and his arsenal reappear in the related final piece "Three Scenes" (2009). The mini chamber orchestra sonance has a kind of dialog with the solo percussion. A saw part is there again (briefly) for us. I much liked the composer's handling of the other instruments, and found the entire matrix of varied, ornate, sometimes powerful percussion versus contrapuntally charged chamber instruments quite original and earworthy. And that is my general reaction to the disk. 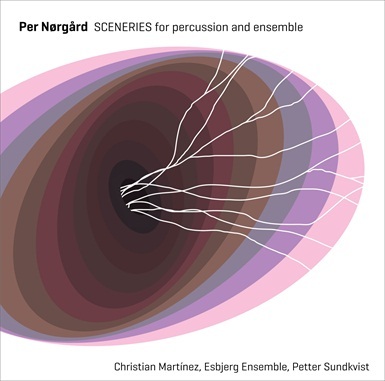 Martinez and the Esbjerg Ensemble under Petter Sundkvist does justice to the sophisticated, unusual music. 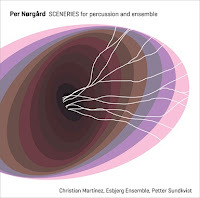 Norgard puts a conceptual twist, it seems, in all he does, so that several listens do not begin to give you a firm image of the composition at hand. What that means is that his originality takes time to get with. This compilation is a fine place to start. My apologies--back after a brief but heartily annoying indisposition. New music can surprise and elate, but not all that often. It happened to me with Peter Maxwell Davies' Symphony No. 3 (Naxos 8.572350). I blanked my mind as best I could before the first hearing. That first time through held me more or less spellbound. It's his 1984 opus recorded and released in that year by Davies and the BBC Philharmonic on a small label. It went unnoticed by some, at least by me--no wonder, that was a gruesome year for me, and by the time I could assess the damage to my existence that year had caused and carry on in musicland, it was nowhere to be seen, where I might have looked anyway (Tower Records in the Village). But I'm guilty anyway because I've never quite gotten around to a systematic exploration of the music of Maestro Davies, other than "Eight Songs for a Mad King". The fault is entirely my own and I do not have the slightest excuse. So there you are. But I am so glad I reached out for this expanded re-release of the recording. First, of course, you get the symphony. 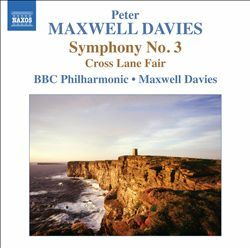 It's an orchestral free-for-all, only decidedly it isn't free but rather carefully composed, and the "for all" orchestral treatment of the phrases can be in sections as much as or more so than flat-out tuttis. The treatment is somehow soft-focus much of the time. Sometimes the edges of the phrases are smoothed over by overlapping orchestration, so that you hear it as if behind a cerebral velvet screen of sorts. The music is thoroughly modernoid, very ambitious, and wholly successful. To my way of thinking it establishes Peter Maxwell Davies as a major symphonist of our (recent) era. You might detect a hint of the flowing cosmos of Ives' Fourth, but ultimately it's all Peter Maxwell Davies. An excellent bonus is the presence of his 1994 "Cross Lane Fair," a very real contrast to the symphony. It shows Davies the painter of more literal sounds, a series of vignettes centered around an archaic country fair. Lot's of humorous rusticity abounds, not the least of which is the purposefully out-of-tune set of Northumbrian pipes. It's something the hearing conveys much better than my telling. So there you have it, a disk containing a symphony we shouldn't miss and something light but extraordinarily well done, to leave us smiling. All at the Naxos price. Recommended! 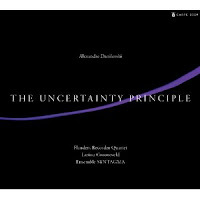 The combination of early or archaic music and modernity that we discussed in part yesterday is with us again today, this time in the presence of present-day Russian-French composer Alexandre Danilevski and his The Uncertainty Principle (Adami CD-16291). There is an elaborate philosophy behind the four-work album that is mapped out in the liners. I will not go into the details because you can read about it at full-length when you get the CD. Zsuzsanna Toth, soprano, Akira Tachikawa, countertenor, Larissa Groeneveld, cello, and Ensemble Syntagma, all under the director of the composer, create a musical universe where an uncanny combination of early music sonance and modernity take various places in the course of the musical unfolding. "Landa" is a haunting song cycle for soprano, recorder, cello and lute. "Revelation (Offenbarung), In memoriam Alfred Schnittke" is a masterful piece for solo cello with transient space and a beautiful resonance. "Oda an die Traurigkeit" brings in the full ensemble, and in the beginning utilizes a droning not unrelated to early music organum, combined with contemporary expressive elements. There is a beautfully written and performed contrapuntal-round duet between soprano and countertenor with cello that stays in the mind and has an extraordinary sad beauty in some ways characteristic of an earlier age. The interlude that follows has soundscape ambiance and mystery. The final movement returns soprano and countertenor for more round-centered lamenting. "Antiphones" for recorder quartet has some exceptional early-late juxtapositions and sends the music to a final resting place that makes you want to hear more. 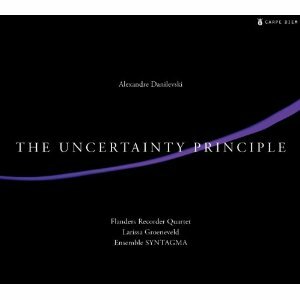 Alexandre Danilevski comes up with breakthrough music on the Uncertainty Principle. Not Arvo Part but a part of the early-late tendency today, Danilevski goes in original directions here and has a unique take on making the music of today more timeless. Recommended. When the history of music comes to mind, especially I suppose in the classical realm, it's something like how we ordinarily think of the history of anything. It's like a giant roll of wallpaper, wide enough to accommodate what's going on that's considered important at any time, and then it's thick enough so we can start unrolling at some sort of beginning (Ancient Greece? Gregorian? What?) and keep unrolling to find a succession of styles through to today. It has in part to do with our conception of time "flying from A to B like an arrow to its target." And there is much to be gained thinking of the history that way. Somewhere in the early '70s of last century, however, a strictly linear view of the world started to break down, if just a little bit. The idea of progress and evolution to ever greater heights became a little problematic. After Modernism, what? Well, Minimalism, for one. Then all kinds of Neo-this and Neo-that, a few that have not been formally named, even. But no clear A to B movement, as far as I can tell. If the linear progress of composers' tackling ever more daunting complexities has broken down, we have people like Alan Hovhaness in part to thank. Of course it's never been that simple anyway. J. S. Bach was still working in an earlier style when Rococo Classicism was first stirring. Charles Ives was in some ways a father of Modernism, but he had Romantic aspects and he also created deliberate clashes between simple pop ditties or hymn tunes in multiple conflicting performance with perhaps some strident dissonances as well, and in that way looked forward to a post- situation. Lou Harrison was attracted to the musics of the East and made that a huge part of his music. John Cage in his prepared piano pieces was often something other than "Modern" as such. Nonetheless composer Alan Hovhaness stands out as one of the prophetic figures. He turned to the music of his Armenian heritage, and later classical music of Japan and other influences, to hammer out a music that was not Modern in the sense of what was going on around him. And yet his music was decidedly not eclectic either. Every Hovhaness opus bears his unique stylistic stamp. 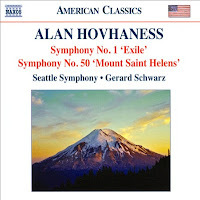 And so we come finally to today's CD, a recording of two Hovhaness symphonies by the fine Seattle Symphony under Gerard Schwarz, Symphony No. 1 'Exile' and Symphony No. 50 'Mount Saint Helens' (Naxos 8.559717). The Symphony No. 1 is an important one for understanding Hovhaness the composer. It is dedicated to those Armenians who were forced to leave Turkey during a pogram situation in the early 20th Century. It's pure Hovhaness. All the things Alan was as a composer were more or less in that symphony, albeit in a less developed state. It was in melodic form, in melodic contour that Hovhaness showed his traditional Armenian influence. What he did with it was (and is) what Hovhaness is about. It's a mature work and a crucial reference point to where he began. Schwarz and the Seattle Symphony give a most sympathetic reading, as they do all the music on this disk. In between the 1st and the 50th Schwarz interjects an excellent and representative work from Hovhaness's middle period, the "Fantasy on Japanese Woodprints" from 1965. Again, there is a melodic arch that clearly comes out of Japanese classical music. What is done with the theme is Hovhaness in pure form. The final work comes from 1982, moving towards the end of his life. 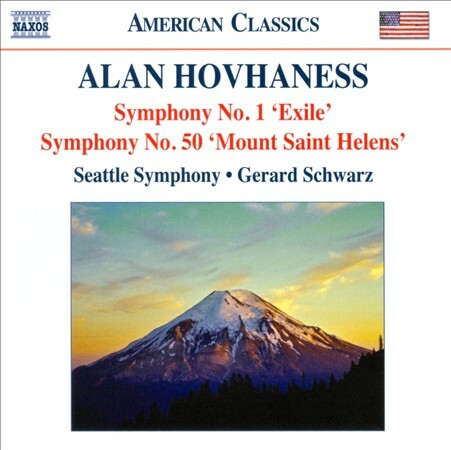 The "Mount St. Helens" Symphony No. 50 gives us very magestic music that becomes quite turbulent, then triumphantly chorale-like in the last movement--depicting the mountain in repose, then in irruption. Like all Hovhaness, there is an archaic quality (as the liner notes point out), sometimes evoking Eastern Orthodox chant, sometimes other older forms, but here, as often elsewhere in his music there is Modernism to be heard in non-harmonic tones and pieces of dissonance, a bit of orchestral chaos. So it is never so simple. Hovhaness does not fit into the endless scroll idea of music history, except that he was a pioneer in his use of non-contemporary and non-Western elements in forging his music. Nowadays we have Arvo Part to appreciate doing this sort of thing in his very own way. But Hovhaness was there when it was a little bit of a daring thing to do. In the end what counts of course is the music. The three Hovhaness works presented on the Naxos release at hand are very representative, very moving and enjoyable, and very well performed. Some music doesn't go where you'd expect. 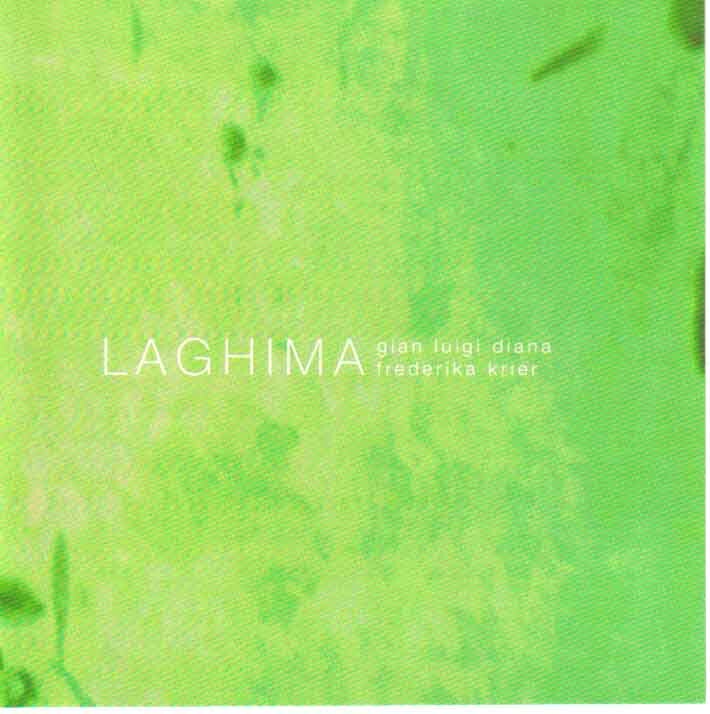 Gian Luigi Diana and Frederika Krier's Laghima (Setola di Maiale SM2090) has that quality. It's free improvisation or, as they call it, instant composition that forges its musical vocabulary from the music and sounds the artists themselves hear, rather than a strictly avant or new music framework. There are electronic elements ranging from vaguely "world" or "ethnic" to soundscaping and cosmic otherworldliness, there is the African kalimba (all energized and realized by Gian Luigi Diana), and there is the wide ranging concert/world violin playing of Frederika Krier, who has some of the tensile strength of Szigeti, an avant sounding approach and a kind of declamatory rhapsodism without undue sentiment. The album goes freely to places the artists take it according to the considered inspiration of the moment. So you may have repeating electronic motives against a threnodic sort of lament on violin, explorations of pure sound that generally maintain a tonality, and many things in between. It's a fascinating result that needs to be heard attentively and successively to make its point. Like the album Blurboxer covered several days ago and also featuring Mr. Diana, this is music of a different sort. "Laghima" in the Sanskrit refers to levitation, becoming light as a feather. The music can do that if you open yourself to it. 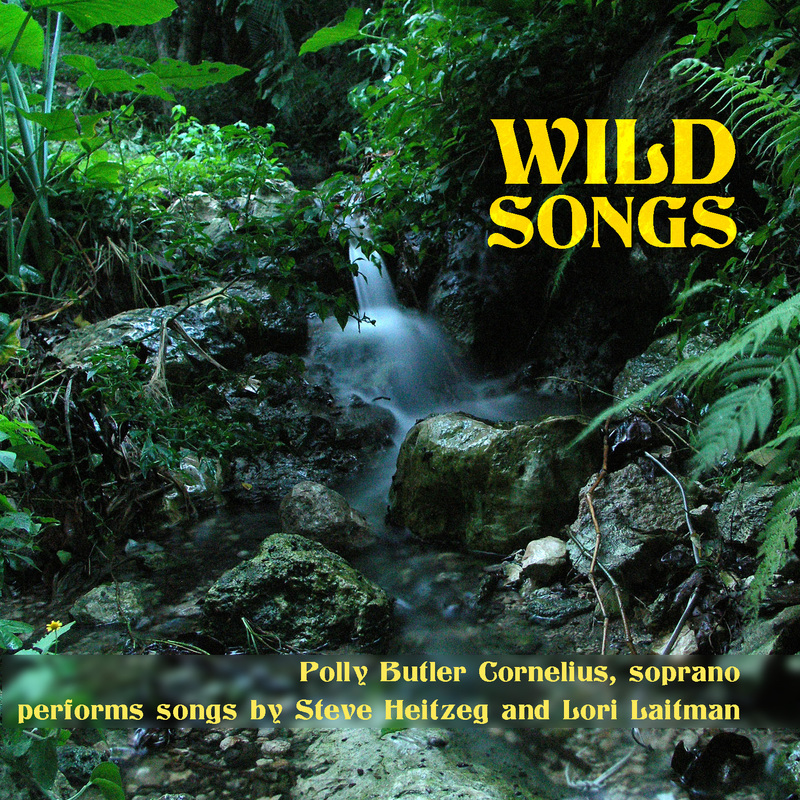 This is a vocal recital of songs by Steve Heitzeg and Lori Laitman. Polly Butler Cornelius fills the room with her soprano delivery. She is joined by Victoria Fischer Faw on piano and the percussion work of Heather Barringer and Patti Cudd. The recital is named after Heitzeg's three-work cycle Wild Songs (Innova 825), which through its "natural" percussion and environmental sounds, and lyrics centering around the environment and its preservation, bring the mood toward the organic, so to say. 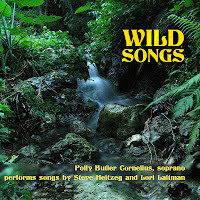 The song program has a touch of minimalism in a kind of referencing of a tribal sound (especially the marimba in "Wild Songs") but mostly it builds around the American song heritage begun by Ives and continued by Copland, Harrison and others. It's not Americana per se but rather draws upon the long tradition of song in America. Lyrics follow suit, with two cycles based on Emily Dickinson poems, and one, sadly, on the last words of Robert Kennedy. Polly Butler Cornelius has a fairly wide vibrato that takes a bit of getting used to. But she is dramatic and dynamic in this recital and the song material is very much worth hearing. American art song? Here are some good examples of the new/natural in the old and the old in the new/natural. I conclude my informal and incomplete survey of Weinberg's symphonies on disk with another one from Thord Svedlund and the Gothenberg Symphony Orchestra, namely Weinberg's No. 20--paired with the Cello Concerto, op. 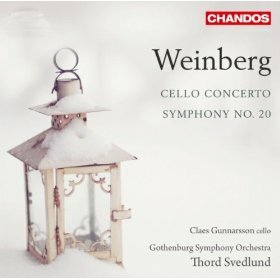 43, Claes Gunnarsson, soloist (Chandos). The Symphony No. 20 bears the hallmarks of Weinberg's later style. Long-formed flow, a bit more dissonance, perhaps more wholly original but less directly communicating on a melodic level. The thematic material is more asymmetrical and diffuse. It is a somber affair for the most part. Its treasures do not necessarily yield themselves to us on first listen but emerge only gradually on repeated returns. The Cello Concerto is on less rarified ground. The solo cello part is in turns plaintive, melodically somewhat Semitic, turbulent, Slavic, discursive and immediately engaging. It is a more accessible work and the orchestral accompaniment of course plays a large part in the mood painting of each movement. Gunnarsson sounds well-suited temperamentally and technically to his role. And as always Thord Svedlund and the Gothenberg Symphony combine attention to detail and passion equally for a fine set of performances. This is another welcome release and shows a few more sides of Weinberg's multifaceted composing brilliance. It may not be quite as enthralling as a few of the disks discussed earlier. In some ways this music demands a bit more of the listener than some of his earlier symphonic works, but nonetheless--or perhaps because of that--it should be heard by those who wish a full picture of Weinberg over his career. Sometimes the experience of a new composer is like opening a gift from someone you do not know. As you unwrap it a picture emerges of what you are getting but the first moments are filled with mystery. I felt a little like that when I first listened to the music on the CD at hand: Thierry Pécou, Caribbean composer, and his CD covering Tremendum (Harmonia Mundi) and five other chamber works. Ensemble Variances and Percussions Claviers de Lyon do a capital job realizing the music, and the music is quite different. There is a bit of high modernism, minimalist phrasings put in new contexts, and some of the idiomatic vernacular of Caribbean and Latin American rhythm and melody, transformed in ways one might not anticipate. It's very original music and so less easy to describe than the usual case. And there does not seem to be one Pécou style at work. Some of the pieces have an engaging motor rhythmic quality, especially those that feature the marimba and/or mallet percussion prominently, others have a kind of ritualistic feel to them, some at times exemplify a pomo modernism-meets-the-world quality. This is his third recording for Harmonia Mundi, and in some ways I feel like I am walking in on the middle of a conversation, that the previous music might help me understand the developments that have led to these works. But even without that background I feel I am in the presence of a rather extraordinary music sensibility. And I feel the better for having listened to this disk a number of times. It's one of those situations where I have an incomplete knowledge, and so an incomplete experience of the composer. I will say that the music is of a high level of interest. Recommended for those looking for the new in new music. In life you cannot go back. We all know that, like it or not. But in music, you can. Take for example Schubert's String Quartets. We can re-experience them any time. We can hear the old recordings that first inspired us. And we can hear new recordings, some of them so fresh, so regenerative that we experience the works anew, go back to a more primal Schubert, get to know him on a different level. That's the feeling I get listening to Cuarteto Casals's recording of Schubert's Quartets D87 (no. 10) and D887 (no. 15) (Harmonia Mundi). It's a Schubert that speaks more directly to us, unclouded by the accumulated years of Romantic string techniques, by excessive vibrato, by a certain faux gush that recordings mostly all had of this period of music when I was growing up. 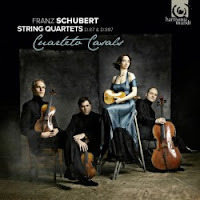 Cuarteto Casals ditches the schmaltz and instead articulates the quartets with a wealth of attacks, a legato that sings without weeping, a brio that is infectious, a vibrato that appears at appropriate points only, crescendos and swells that make logical and emotional sense for today, and perhaps are closer to Schubert's conception as well. The D87 was written when Schubert was only 16, amazing in itself given the full development to be heard in the work. In Cuarteto Casals's hands you truly can feel the influence of Austrian folk idioms, the beauty of its lyrical directness. The D887 on the other hand is deep, long form Schubert, his last quartet. It has a majesty and a labyrinthan quality that could only come from the pen of the fully developed composer at his peak. Cuarteto Casals comes through again with a beautiful articulation and differentiation, a heroic quality that the work surely embodies. This recording is a triumph, a masterful performance of beautiful music. It ranks in my mind with what Colin Davis did with the string section for an Elgar symphony when he visited New York some years ago. He, like Cuarteto Casals, made you hear the work anew with a detailed articulation of every phrase. It's Schubert like he was meant to be heard. Ravishingly so. When you are in the proper frame of mind and the music and performance is right, early music places you in an unfamiliar world, another time, musical forms and cultural values that you may know something of but have not had the primary experience of "being there". The music of Christopher Gibbons (1615-1676) has that power to transport us, at least on the CD Motets, Anthems, Fantasias & Voluntaries (Harmonia Mundi), which is just coming out here in the States. It's The Academy of Ancient Music, The Choir of the AAM, Richard Egarr, director. They take great care in both the vocal and instrumental solos, the choir and the instrumental ensembles, to bring out the special qualities of music of England's post-Elizabethan period. 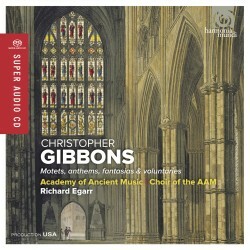 Christopher Gibbons, son of Orlando Gibbons, gets a kind of thumbnail portrait through a wide range of short works he wrote for various occasions. So you hear solo organ voluntaries (first recordings), choral motets, consorts of various instruments, and consorts with one or more vocal soloists. Here is a valuable disk for anyone interested in this period of English early music. Christopher has been overshadowed by his more famous father and this music shows him fully deserving of our attention. The performances are excellent, the music very good, and if you close your eyes, you can put yourself for an hour out of the present and in a very different past. An especially welcome addition for early music fans, musical Anglophiles, and the adventuresome-curious. Recommended. A mysterioso opening movement puts Weinberg's Symphony No. 3 in a class by itself. We continue today to examine the Svedlund/Gothenburg Symphony Orchestra cycle. 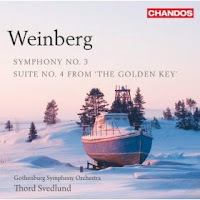 This one backs Weinberg's Third with the "Golden Key Suite No 4" (Chandos). The second movement has a lively scherzo/dance quality. The third movement, an adagio, returns to the mysterious, and has a somewhat bleak mood to it. Towards the middle it bursts out in an anguished fortissimo in a kind of expressionist equivalent of a sob. It returns at the end to the quiet mystery-sorrow of the beginning. The final movement is very agitated and filled with motion. All is well-played by Svedlund and the Gothenburg Symphony. 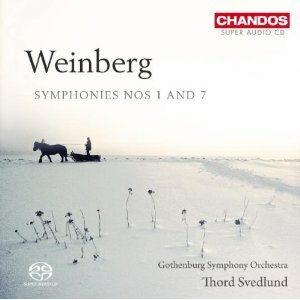 The symphony may not be essential if you are not looking to get Weinberg's complete output. Some music defies simple categorization. It is not rock or pop, though it pulsates. It is not jazz, though there is improvisation. It is not soundscape/new age per se, though there is flow and mellifluousness. It is not modern classical-avant, though there is a kind of wide compositional thrust. 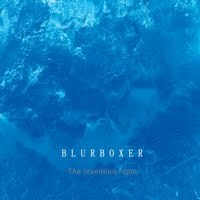 Such describes Blurboxer and their CD The Invention Room (self-released). Blurboxer is G. L. Diana on live electronics, sound processing and sitar, Lisa Dowling on contrabass, plus for several pieces Patrick Holmes on clarinet or Tony Jarvis, bass clarinet. Each piece has composed and seemingly spontaneous elements. In many ways the artists use the studio setting as their canvas. The end result is inseparable from the way the music is mixed, balanced and processed into recorded sound. Contrabass, sometimes sitar and wind soloists tend to play structured motifs much of the time and electronic loops and timbres give the sound a grounding and a flow. Like conventional minimalism, there can be repetition. But Blurboxer tends towards phases and sound structures untypical of composers working in that style. And perhaps that is what especially interests me. The form is usually not unfamiliar but the music itself, the notes and the overall ambiance is unexpected. For that reason it took me several listens to get a grasp of what I was hearing. It is different, in other words, rather original, avant but pretty much accessible to anyone. Blurboxer. A new, worthy electro-acoustic environment for your ears. . .
To finish off the week, another disc of Mieczyslaw Weinberg symphonies, this time Nos. 1 & 7 (Chandos). It's once again Thor Svedlund conducting--the Gothenburg Symphony Orchestra for one, The National Orchestra of Sweden for the other. Weinberg continues to impress and interest me. He was a Polish Jew that came to Russia and made his career there, and you can hear in his music a little of all three cultures--but primarily as a symphonist it is his distinctive compositional personality that prevails. The No. 1 has a marvelous opening movement with a kind of endlessly permutating melody. The symphony sounds fully mature, almost a Polish-Jewish-Russian Sibelius-Mahler with more dissonance. He modulates in interesting, sometimes abrupt ways, similar to Prokofiev in this period. The fourth movement is contrapuntal and bold, filled with excitement. The work has much charm and is decidedly no student work. It's fully mature Weinberg. No. 7 is unusual in that it has a prominent part for harpsichord, which Erik Risberg handles adroitly. The symphony is a bit more on the moody side, sometimes agitated, with moments where a folk-dance element intervenes in effective ways, especially in the long final movement, where there is some forceful, madly insistent motives that take those elements and give them an almost brutally modern slant. It's great listening. And it is another masterful work. Svedlund's Weinberg cycle is marvelously done from what I have heard at this point. And judging by what I have experienced of the composer's work thus far, Weinberg is a major symphonist. This volume features two excellent examples, played with great spirit. Listen to this disk and I think you'll find much to savor. There are living composers creating work right now, all over the world. Some follow a particular footpath, some blaze new trails, some expand the traditions in different ways, others prefer to keep to the well-trodden ways of making music. Newton D. Strandberg, American composer, is one who expands on the modernist tradition, judging from his retrospective CD Essays and Sketches (Ravello 7840). He's been for a long time a member of the faculty at Sam Houston State University. Four works comprise the program of this CD: three in the orchestral/chamber orchestral zone, "Essay for Orchestra," "Amenhotep III," and "Acts for Orchestra." Then there is his "String Trio." In all the works (which by the way receive quite reasonably good performances by various ensembles) you hear a combination of a sort of "thickened" lyricism that has the bite of the modern and a driving motor-pulsation that in its own way plays off of the rhythmic complexities given so forcefully to us in Stravinsky's "Rite of Spring." 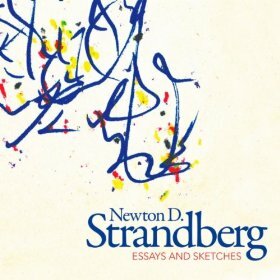 That is to say that Strandberg often creates complex landscapes of rhythmically bracing music. The String Trio on the other hand is a piece of inspired strength and dissonance that stands in a rather different relation to modern tradition. In any case Maestro Strandberg works with his own vocabulary throughout to create music of beauty, excitement and depth. I found much to listen to with keen interest on this disk. Newton D. Strandberg is no lightweight. Modernists take heed. The Spanish conquerer-colonialists of the New World brought their music with them when they resettled, as all peoples tend to do. Gradually the music of the indigenes influenced the Conquistadores-settlers until some ways down the path of time a new music was born (or rather new musics in the plural). 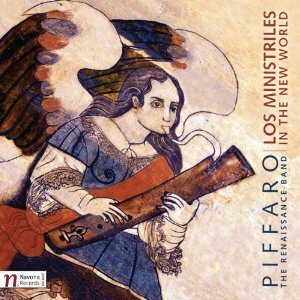 Piffaro, the Renaissance Band, devote their time productively on their third album, Los Ministriles in the New World (Navona 5875), to the early music phase of the process of assimilation and change. In 30 short instrumental works from the Spanish homeland and the New World a picture emerges of the musical landscape of the Spanish settlers. There are hints of influence (sometimes broad) but the unmediated listening ear (or mine) rarely if ever picks up traces of radical changes in style that would tip one off that there was a thorough musical assimilation taking place. This is understandable at such an early date in the long history of cultural co-mingling. It wan't a situation where there would be cataclysmic changes in Spanish musical culture in the New World because there was initially a conqueror-conquered distance placed between the groups. So we have a competent early music-original instruments ensemble playing the charming miniatures with enthusiasm. The unusual nature of the repertoire makes it a valuable addition to your early music library. And it makes for a most pleasant listen.